Interested in utilizing the new bocce ball courts at Ten Trails but don’t know how to play? We have got you covered! Check out the infographic below for a quick and easy way to get started playing bocce ball. For more detailed information on the game, contact our friends at the Auburn Bocce Club! The right grip is the key to making a good toss in the game of bocce ball. Before releasing the ball, spread your fingers out evenly around the ball to support its weight, and make sure to not apply any pressure with your thumb. Your thumb should only be used to guide the direction of the ball. 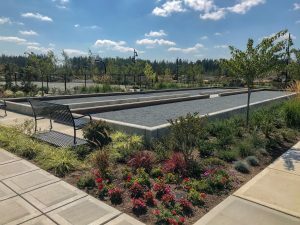 Ten Trails residents are lucky to have brand new bocce ball courts to use at the new Civic Park! Along with our amazing playground, complete with hammock swing and hill slide, we also have new, gravel-covered courts for your enjoyment. Don’t have a bocce set? Ask to borrow one from the staff at the Ten Trails Welcome Center! Don’t give up if you’re not great at the game right from the start! Becoming an expert at this game takes time, patience and lots of practice! Need more information? Check out our infographic below!